To celebrate its new Saucy BBQ Stuffed Crust, Domino’s Pizza, the pizza delivery expert, has launched a Showdown Facebook game with pizza prizes up for grabs. 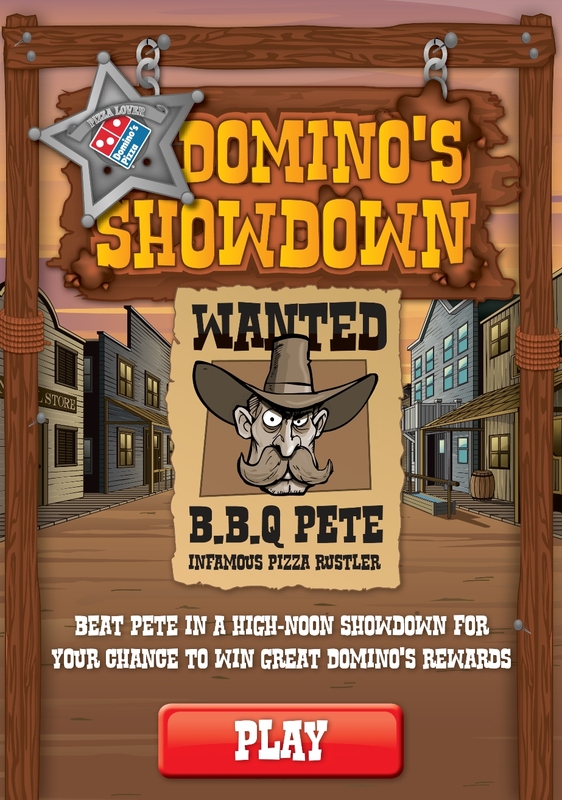 Domino’s UK fans can test their Wild West knowledge by answering a series of question in a cowboy duel against BBQ Pete online at www.facebook.com/DominosPizza. Players can customise their cowboy character by adding a photo from their Facebook profile. For every question answered correctly, the player moves a step forwards – just like in a classic high noon showdown. If they beat BBQ Pete and take 10 steps before he does, they’ll shoot a squirt of BBQ sauce at him. The quicker the player achieves this, the more points they score. Players can invite their Facebook friends to join in too by creating their very own rancour of cowboys with the aim of scoring as many points in a group as possible. The BBQ sauce shooters will rank on the Domino’s Showdown leader board and the team at the top each Friday will win a pizza party. Domino’s Saucy BBQ Stuffed Crust is now available nationwide, featuring Domino’s Stuffed Crust with an extra saucy stuffing of Domino’s classic Texas BBQ sauce in the crust. Every Domino’s Stuffed Crust is made from scratch using fresh dough with mozzarella cheese with a hint of garlic and herbs. The new Saucy BBQ Stuffed Crust is particularly tasty when eaten with a Domino’s Texas BBQ pizza. Try your luck on Domino’s Showdown game at www.facebook.com/DominosPizza. Domino’s Saucy BBQ Stuffed Crust is now available on all medium and large pizzas. UK stores only. Customers in the UK can order online at www.dominos.co.uk, customers in the Republic of Ireland can order online at www.dominos.ie and customers in Germany can order online at www.dominos.de. In addition, mobile customers can order by downloading Domino’s free iPhone, iPad, Android and Windows Phone 7 apps. This press release was distributed by ResponseSource Press Release Wire on behalf of Arena Media in the following categories: Food & Drink, for more information visit https://pressreleasewire.responsesource.com/about.